The Golden Globes will be kicking off the 2019 awards season on Sunday, January 6 at 8 p.m. ET. 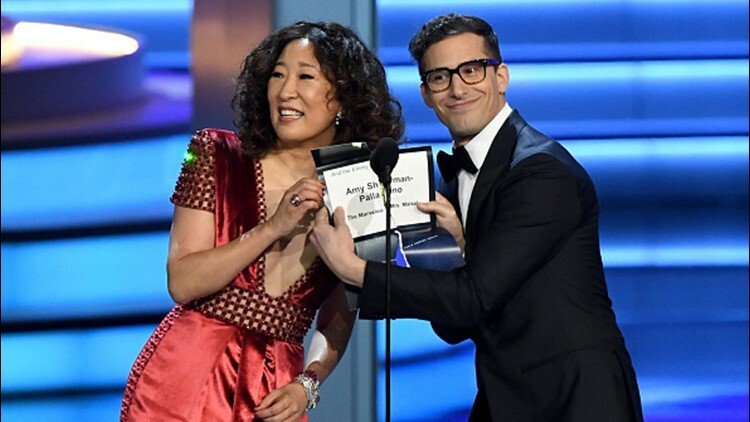 It's the first time hosting a major awards show for Oh, an Emmy Award nominee for Lead Actress in a Drama this year for "Eve" and past Golden Globe winner for playing Dr. Cristina Yang on ABC's "Grey's Anatomy." Samberg, also a Golden Globe winner for his comedic role in cop comedy "Brooklyn," previously hosted the Emmys in 2015, earning mixed reviews. He won Best Performance by an Actor in a Television Series – Musical or Comedy and as a producer for Best Television Series – Musical or Comedy. The new season of Samberg’s “Brooklyn Nine-Nine” will begin the week of the awards show on Thursday, January 10. NBC Entertainment Co-Chairmen Paul Telegdy and George Cheeks say that the co-hosts selection will be sure to bring “another unforgettable fun-filled night,” and Twitter seems to agree. me: wow golden globes, the best in the business!